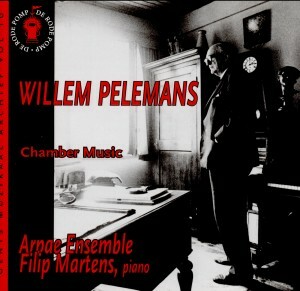 A much respected pedagogue and music critic, Willem Pelemans was first and foremost a most distinguished composer with a huge and varied output to his credit. This ranges from short piano pieces such as Les rêves de Tom (1929) to a large-scale opera De mannen van Smeerop (1952) and includes six symphonies, six concertos for orchestra, a number of concertos, 19 piano sonatas, numerous songs and song cycles, eight string quartets, choral songs and cycles, three chamber operas and a large-scale Mass (1944) that many regard as one of his finest achievements. Needless to say, little of this is heard nowadays, let alone recorded, which makes the present release the more welcome. The works recorded here span some twenty years of his long composing life. Banaliteiten ("banalities"), a suite of nine character pieces for piano, was completed in 1944 and is the earliest work here. It is a delightful set of nine contrasted sketches, all fairly straightforward, but in no way as banal as its title might suggest. Unfortunately, the whole set has not been recorded, which is a pity and incomprehensible since the total playing time would have allowed for the inclusion of the complete set. This and the other pieces do not differ much from each other, i.e. stylistically speaking, for each one has its own character, so that this selection is happily free from monotony. Moreover each piece is superbly written for the instrument bringing out the best. This is particularly evident in the attractive Preludium, Aria en Wals for harp and the delightful Harp Quintet (1962 v harp, flute and string trio) that may bring Ravel to mind. Pelemans music is very Gallic in tone, although it is always personal, without being innovative. Pelemans found his musical voice quite early in his career and stuck to it throughout his entire composing life, although he always managed to bring in as much variety and invention as possible, so as not to repeat himself. His music is characterised by formal clarity, economy of means and imbued with an almost endless melodic fund and unstoppable energy. His pieces are concise, perfectly balanced, never over-exploit their basic material and thus never outstay their welcome. No towering masterpieces here, but several attractive, superbly crafted works as rewarding to play as they are to listen to.